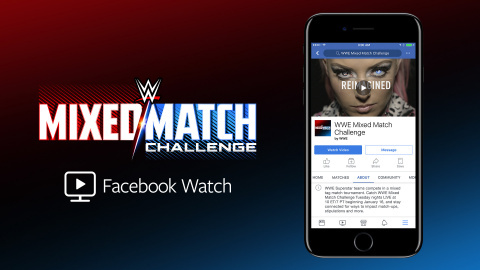 Facebook and WWE (NYSE: WWE) today announced a new in-ring series, Mixed Match Challenge™,that will stream livein the U.S.exclusively on Facebook on Tuesday nights beginning January 16 at 10 p.m. ET. The 12–episode series will air on Facebook Watch and feature WWE Superstars from both the Raw®and SmackDown® Live rosters competing in a single-elimination mixed tag-team tournament to win $100,000 to support the charity of their choice. Each 20-minute episode will reflect a progressive approach to production, with elements optimized for mobile consumption, experimentation and social interaction, including the ability for fans to engage with Superstars during the show. In addition, fans will have the opportunity to select match-ups, match stipulations and more, on Facebook. Mixed Match Challenge is a Raw vs. SmackDown Live tournament, where male and female Superstars team up to determine which combination of strength, skill, athleticism and experience reigns supreme. The unique storylines for Mixed Match Challenge will continue between episodes across WWE’s Facebook Pages with short-form videos and social content. WWE will also promote the series across its extensive digital and social footprint, including a new Facebook Watch show Page dedicated to Mixed Match Challenge. A promotional trailer for the show can be watched here. WWE is a powerhouse on social media with more than 825 million followers globally. WWE has nearly 500 million likes across all Facebook Pages and WWE’s main Facebook Page has more than 38 million likes. WWE Superstar John Cena® is the #1 most-followed active U.S. athlete on Facebook with more than 45 million likes.